While there may be some on the blogosphere who claim that a gentleman doesn't dine in restaurants, it is Reggie's view that a fellow needn't be the opposite of one if he enjoys doing so. Although Reggie has the good fortune to be a member of one of New York's venerable clubs where he is able to dine excellently whenever he so chooses, he believes that life would be far less enjoyable indeed if he were to confine his gustatory pleasures to only within such walls when venturing beyond the sanctity of his own dining room, or those of his entertaining friends. As readers of this blog well know, Reggie regularly eats out with pleasure in New York City's restaurants, and has reviewed a number of them here on this blog. He believes that one of the great pleasures of living in New York is the access it provides to excellent, varied, and superb restaurants, and he believes that refraining from going to them would be silliness indeed. He's working on a number of additional restaurant reviews at this time that he looks forward to posting for his readers' delectation in the not-too-distant future. In the meantime, I thought it would be helpful, Dear Reader, if I were to outline my basic rules for dining in what I call "better" restaurants, which is the type of restaurant I (mostly) choose to frequent these days when out for an evening in New York (or elsewhere, for that matter). 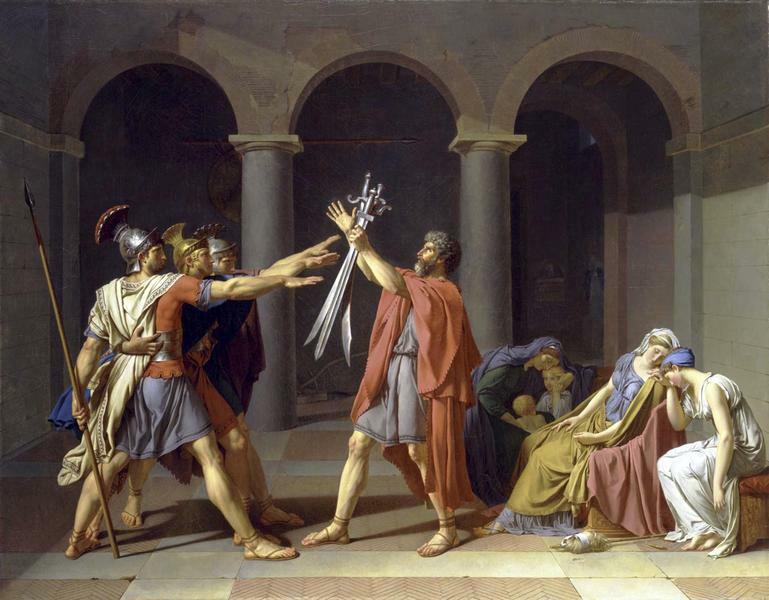 I have divided my essay into two parts: the first focuses on the primary, or most important, rules for doing so, and the second outlines additional rules of a more miscellaneous nature. I may even add a third one, if I feel it appropriate to do so. It may be fine to wear cargo shorts and a tee shirt to a quick gobble at a pizza parlor or the Olive Garden (a "casual dining" restaurant chain that Reggie has never eaten in, but is familiar with from having seen their impossibly cheery commercials on television), but it is not at all appropriate, in his view, to wear such an outfit to what I call "better restaurants," namely those where the food is superior to the run-of-the-mill, the rooms are carefully and (sometimes) expensively decorated, the tables are covered with cloths, and the maître d' is dressed in a suit, or an approximation of same. Reggie is routinely shocked at what he sees people showing up wearing at such restaurants these days, and dismayed that the miscreants who do so are rarely turned away by management, despite said diners' brazen flouting of the establishment's (oftentimes) published dress codes. Reggie firmly believes that if one is going to a "better" restaurant one should wear "better" clothes to do so, both out of respect for the establishment and for the sensibilities of the other diners who have made the effort to dress appropriately. Sometimes a restaurant's maître d' will initially show diners to a room's less desirable tables, hoping that they can fill them before surrendering the room's better-placed, or more desirable tables. While Reggie is sympathetic to the desire to spread diners throughout a restaurant's rooms, he believes one needn't accept a table located next to the kitchen's swinging doors or a busy serving station, simply because that is what one is first offered. It is more than acceptable, in his view, when shown to such a table to nicely ask to be seated instead at a different table, if one is available. All one need say is, "I would prefer to have a table over there, if possible, please," and nod in the direction of where one would like to be seated. You may not get the exact table you wish for, but odds are high that you will at least be seated at a better table than what you have initially been offered. 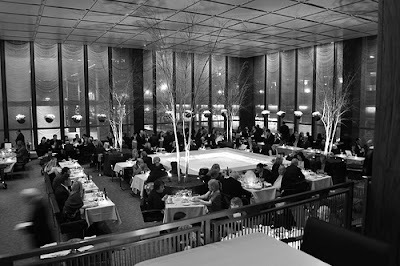 Popular New York restaurants often jam their tables close together, with diners at neighboring tables sitting cheek to jowl. If you should find yourself being seated in such a restaurant, it is basic good manners to acknowledge the diners at the tables on either side of yours, particularly if you have to "excuse me" your way between the tables to reach your seat. A simple "Good evening" will do. Once you have been seated, have good manners and acknowledge your servers as they go about their business of attending to you, since they are human beings and have feelings, too. Do thank the person who takes your order and delivers your food, and also the busboy when he pours your water or removes your plate at the end of the meal. You needn't go overboard in doing it, but you shouldn't ignore them, either. If your server appears to be somewhat over-familiar with you, and asks a few too many questions along the lines of "How are we doing tonight?" it is appropriate to respond "Well, thank you," and leave it at that. You needn't feel compelled to ask them how they are "doing" or engage in exchanging names with them, at least if you are not so inclined. Do be polite, however. Such activity is vulgar and is to be avoided, and is a decided disincentive to the person whose attention you are seeking to come to your assistance. Simply raising your hand and making eye contact is usually sufficient to draw the attention of a restaurant's staff. On the other hand, if you feel you are being egregiously ignored, for whatever reason, it is in your right to (discretely) bring it to the maître d's attention, so that they can remedy the situation. A restaurant's management would rather you be a satisfied customer than a disappointed one, as satisfied customers are repeat customers and disappointed ones are not. So, if you ordered your salmon cooked "medium," and it is delivered to you either undercooked or overdone, do not hesitate to (nicely) send it back to have it cooked the way you asked for it (or replaced with one that is). That does not mean you have license to be persnickety, or unreasonable, or difficult about it—just politely ask that the food you ordered be cooked the way you requested it (and are, incidentally, paying to have provided to you). The same goes for a bottle of wine—it is appropriate to send a bottle back if it is "off," but it is not acceptable to send it back simply because after tasting it you don't care for the vintage. You are not sitting in a cone of silence. Respect the fact that the people within earshot are paying to spend a pleasant evening out, and listening to their fellow diners' foul language, squabbles, or less-than-flattering commentary is not part of what they have signed on for. Keep a lid on it when out in public, please, and confine such unbecoming chatter to when and where you don't have an audience of strangers forced to listen to it. Now, Reggie admits that there are certain, very rare instances when it is permissible to take off one's gloves in public and really let one's dinner companion have it, audience be damned. 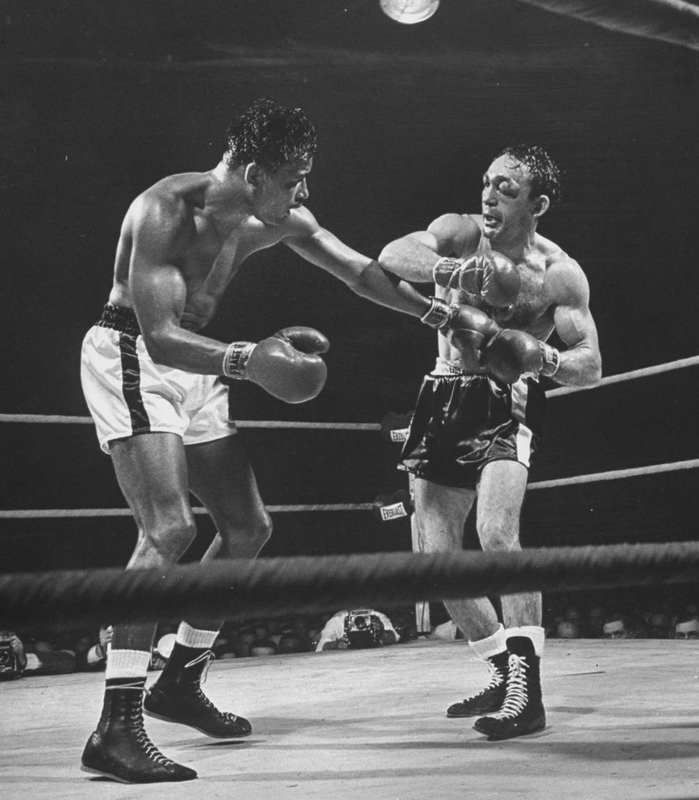 But Reggie believes that one should be extremely selective when doing so, and that one should only do it when one has been most shockingly and violently provoked. It should be reserved only for those once-in-a-lifetime situations where one's dinner companion has (for whatever reason) insultingly and maliciously crossed a line with you that must never be violated, where there is simply no going back. But only then. Reggie is, in fact, working on a post about just such a confrontation that he once had (rather spectacularly) in a restaurant more than a decade ago, that he looks forward to sharing with you, Dear Reader, one day. Now, getting back to the subject at hand . . . 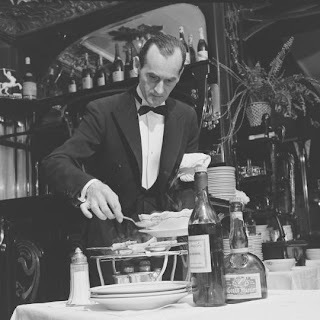 Many restaurants attempt to clear a diner's plate as soon as he (or she) has finished eating, even though there may be others at the table who have not yet finished. This practice is to be discouraged, regardless of the establishment's intentions or general practices. Reggie firmly believes that plates should only be allowed to be removed when everyone at the table has finished the course at hand. Just so there should be no confusion in the matter, Reggie advises that when one has finished eating and others at the table are still eating, one should (a) be careful to place one's utensils on one's plate in such a manner that it is clear that one has not yet finished, and (b) if the waiter or busboy attempts to remove the plate anyway, then one should politely inform them that one has not yet finished, and only allow them to remove the plate once everyone else at the table has also finished. It is only after all of the diners at the table have finished eating that it is appropriate to arrange one's silver in the four o'clock position signifying that one is ready to have one's plate taken away. The point here is that it is up to the diners to dictate to the waiter or busboy when it is appropriate to clear plates from the table, and not the other way around. Restaurants in New York City charge a combined city and state sales tax of 8 ⁷⁄₈%. When determining the proper amount to tip in the city's restaurants, most diners simply double the sales tax as a tip, which is an appropriately generous payout rate of 17 ¾%. When service is better than average, though, rounding the tip up to 20% is merited, and if the service has been truly exceptional, well, then sometimes paying as much as 25% is justified. Next: Reggie's restaurant rules pertaining to children, the use of electronic devices, doggy bags, and when one should call ahead . . .
Reggie would like to bring something to your attention, Dear Reader. He thinks you should use a handkerchief. No, he is not referring to what is rather euphemistically known as "facial tissue," such as Kleenex™, but rather to an old-fashioned cloth handkerchief, the kind your grandparents used. Well, at least Reggie's grandparents used . . .
Reggie carries a handkerchief with him most of the time, and he finds it most useful to have one with him. In fact, he cannot understand why the regular use of handkerchiefs has become something of a rarity in our society today. Even amongst polite people. In order to qualify for Reggie's approval, handkerchiefs needn't be white, they needn't be expensive, nor must they be monogrammed or edged with lace. A plain, inexpensive cotton one with stitched edges will do very nicely, thank you. If one prefers not to carry a white handkerchief (unlike Reggie, who does, at least most of the time), one can find handkerchiefs in any number of appealing colors, including solids, patterns, and prints. A diminutive colorful bandana is perfectly suited (and sometimes preferred) to be used as a handkerchief when one is feeling in a country mood. Just carry a handkerchief, please. Reggie has heard many people say they would never use a handkerchief, as they consider carrying one filled with snot to be disgusting. Well, Reggie agrees, a handkerchief filled with snot is disgusting. But he is not suggesting that you do that, Dear Reader. If one has a horrible cold, producing a lava flow of mucous, Reggie believes one has no business being out in public but rather should be at home in bed, attending to such matters privately. No, he is advocating that his readers carry a handkerchief with them when out and about, because he finds one to be a remarkably convenient and versatile accessory when he is out in public, away from the niceties and hygenic pleasures of his home. While Reggie uses the handkerchiefs he carries to occasionally blow his nose or sneeze into, tasks for which they are admirably suited, he finds handkerchiefs to be far more versatile than merely being a receptacle for one's nasal effluvia. When one is out on a hot summer's afternoon, a handkerchief is the perfect choice to mop one's sometimes sweaty brow, and a far preferable choice for doing so than using one's sleeve, a degraded practice he has seen engaged in by certain baser sorts in public during the warmer months. A handkerchief is a most useful protection, too, when used to grasp something when one is in public that one doesn't particularly care to touch with one's naked hand, such as a grimy subway strap handle, or the knob of a door leading into a heavily used gas station restroom. And Reggie far prefers to use a handkerchief when he is overcome by the sudden need to sneeze, which he frequently is in public, as opposed to using his bare hands, or the more recently advocated practice of using the crook of one's elbow instead of one's hands. He is not so sure that this development is an improvement on the former. But he is more than confident that neither of these options are an improvement over using a handkerchief. Now some people might ask, "But Reggie, why use a handkerchief when a Kleenex™ (or similar) will do?" 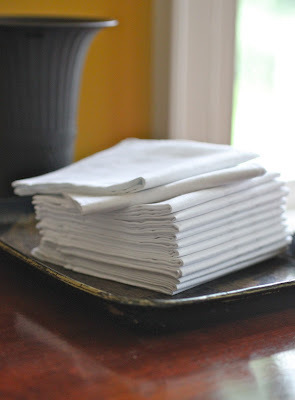 Because, Dear Reader, a handkerchief is sturdier than a Kleenex™, it doesn't rip apart, and it doesn't pill, all of which said Kleenex™ does. Also, if one inadvertently leave's one's handkerchief in the pocket of one's trousers, one is not then confronted with a disintegrated, wadded mess of what once was a piece of Kleenex™ when one reaches one's hand into such trousers after they have been laundered. Others might also say, "But Reggie, don't you find carrying a used handkerchief to be rather unpleasant?" Well, Dear Reader, it is all a matter of degree. Just as I change my undergarments daily, so do I replace the handkerchiefs I use each day, so I can be assured of having a fresh one at hand. That is, after all, why one does laundry (or if one is very fortunate, that is why one has one's laundry done). But I do carry a handkerchief, and I do use it, and I think you should too. This post marks the return of Saucer of the Week, a series interrupted by my musings and remembrances of college reunions past. 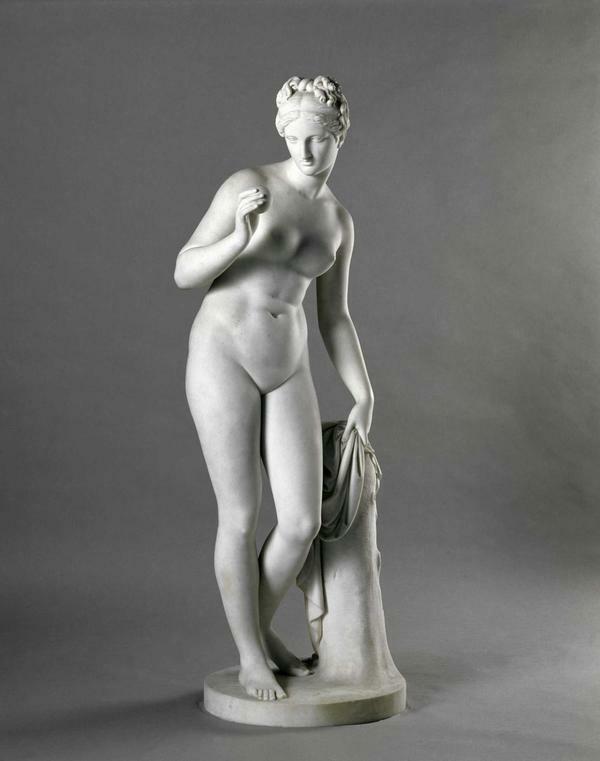 How nice, and what a relief it is, to once again focus one's attention on the pretty and the lighthearted. This week's saucer is, again, an early nineteenth century English one done in the Oriental taste that was then much in vogue. It is more vigorous and vibrant than the ones in such taste I've posted previously, and is a great favorite of mine. I like the refined crudeness of its design. It is decorated with an underglaze application of dark blue, and then subsequent overglaze decorations in orange and green, and a final application of gilding—captured brilliantly in the photograph, above. The saucer measures a generous 5 ½ inches across, and the china it is made of is thicker than on the more rarified saucers I've posted to date. It is unmarked. I suspect that it was made by one of the lesser English potteries of the day, long since vanished, in imitation of what was being produced in the more noteworthy potteries of the time. It is one of a pair that we supposedly bought at Bardith, Ltd., on Madison Avenue years ago. Not everything need always be of only the finest calibre to excite Reggie's fancy, Dear Reader . 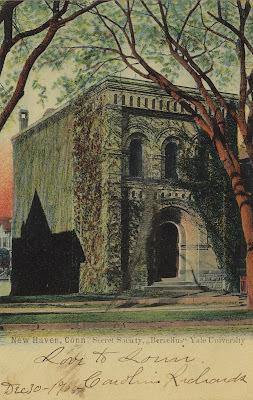 . .
Perhaps much to the relief of some of the readers of my blog, this essay is my last on the three college 25th reunions I have attended over the years. My purpose in writing this series, Dear Reader, is to chronicle how much one aspect of the world I come from has changed during my lifetime, and—in my view—for the better . . . 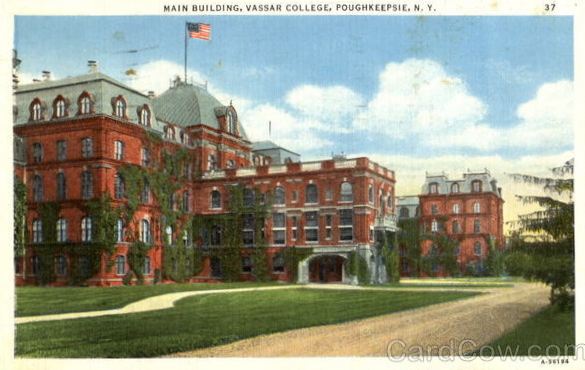 In addition to coming from a family where Yale figures prominently among the men, Vassar figures prominently among the women. 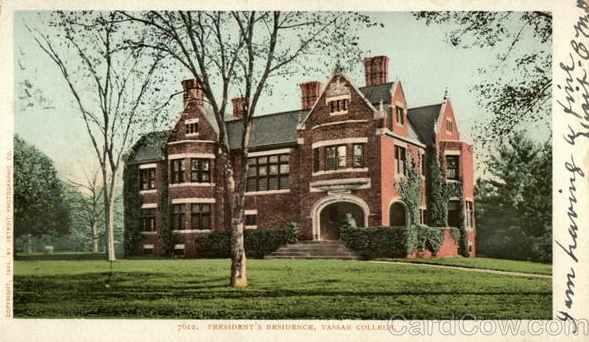 My father’s mother, known as Granny Darling, went to Vassar (class of 1913) and initiated the first Yale/Vassar marriage in my family when she married my grandfather, Yale class of 1911. She dearly hoped that one of her offspring would continue the tradition. My Aunt Mary (her daughter), Vassar class of 1941, was the first to frustrate that wish when she married outside the fold (headstrong girl! 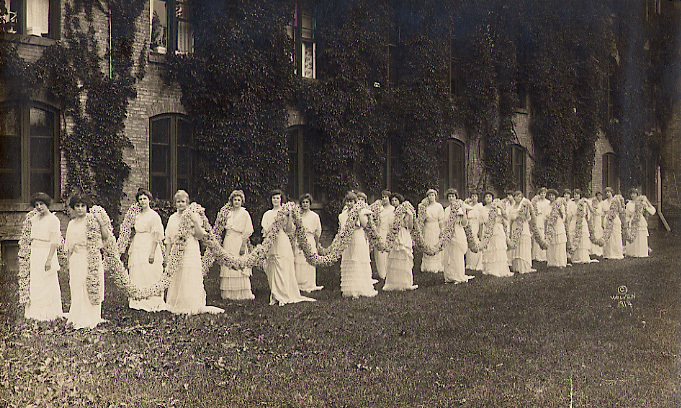 ), and my father disappointed, too, when he married my mother, Sarah Lawrence class of 1943. After both of my Vassar-educated cousins (classes of 1967 and 1972) failed to marry Yale men, Granny then looked, with mounting desperation, to her two grandsons with Yale potential (my older brother Frecky and me) to remedy this unfortunate situation. She was further frustrated when Frecky (Yale class of 1974) married a Brown graduate shortly after finishing Yale. I was, then, her remaining hope for such a felicitous union. 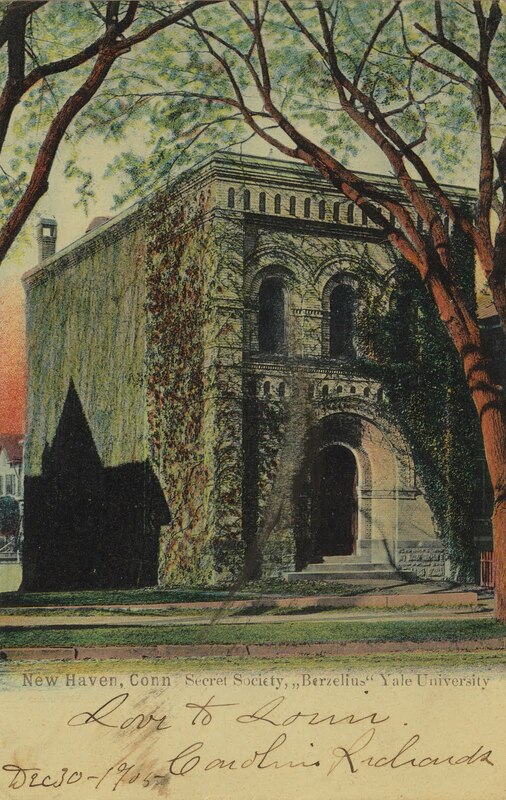 More than once when I was an undergraduate at Yale my Granny Darling gently admonished me to be sure to “look up a nice Vassar girl” in the hopes of achieving her goal. Unfortunately, Granny Darling died before I graduated from Yale and long before I met, and then married, Boy Fenwick, Vassar class of 1985. 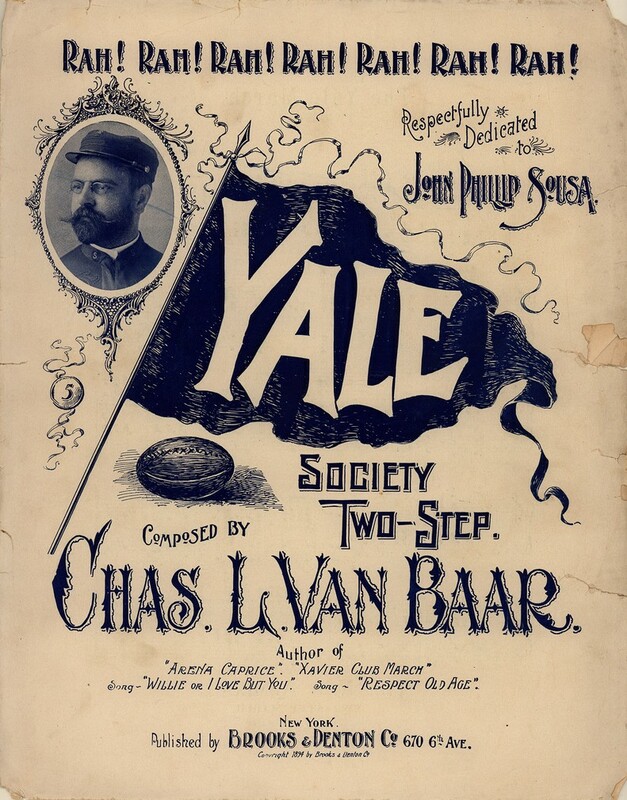 I can just imagine hearing my dear Granny’s reaction upon learning that one of her Yale-educated grandsons had indeed married a Vassar graduate (“At last! What joy!”), followed by her surprise when she learned that I had, in fact, married a Vassar Guy and not a Vassar Girl (“He married WHAT?!”). I am fairly confident that Granny would have eventually come around after her initial shock wore off, since at least it is a Yale/Vassar union after all . . . it’s just not exactly how she had envisioned it. 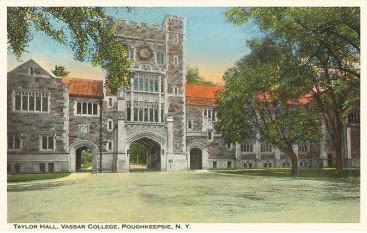 So when I joined Boy at his Vassar 25th reunion last year, I did so more than solely as his spouse, but with an added appreciation of that college’s history, traditions, and its meaning to my family. I enjoyed myself at his reunion, and I had a lot of fun there meeting his college friends and seeing the places on campus where he had once lived, studied and frolicked. 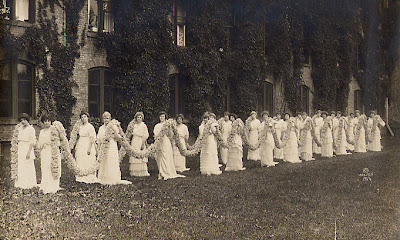 I also thought of my dear Granny Darling and the other Vassar women in my family when I walked around the campus, and I felt a pleasant connection with them and to the school that extended beyond the pleasure that I took in joining Boy there as he and his classmates celebrated. Even though Boy graduated from college only six years after I did, his experience at Vassar was quite different from mine at Yale. For one thing, the majority of his classmates were female (55% to Yale’s 40% when I was there), which is not surprising, given its history. Also, his classmates were a somewhat more diverse group of people than mine had been at Yale, at least they appeared to me at his reunion. Finally, attitudes towards being gay had relaxed considerably by the time he enrolled at Vassar, and he was out as a gay man from the moment he arrived there as a freshman. As I sat at our table under the large white tent during the big class dinner at Boy’s 25th reunion, I felt glad to be there with him and his friends who welcomed me with civility and good humor. 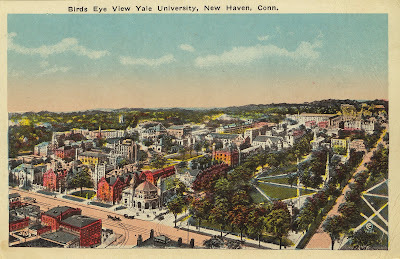 I also felt a connection with my dear Granny Darling, and was amused that her wish for another Yale/Vassar marriage had finally come true, albeit not quite how she had planned it. And I felt very fortunate, indeed, that the world had evolved in my lifetime to such a point that I could happily find myself there with my beloved spouse, under the circumstances that I did. 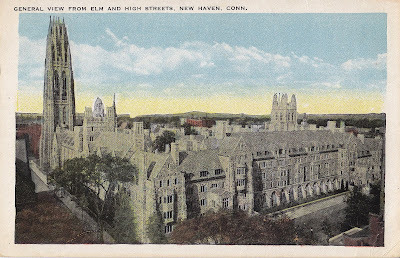 In this post, the second in the series, I reflect on how much had changed in the thirty five years that separated my own Yale 25th reunion from my father's. Although FD's Yale classmates were almost entirely made up of WASPs, after WWII the face of Yale’s undergraduates started to change. Slowly at first, and aided by the G.I. Bill, Yale’s student body began to become more diverse. By the time I entered Yale in September 1975 it was a very different place from the university my father had enrolled in. 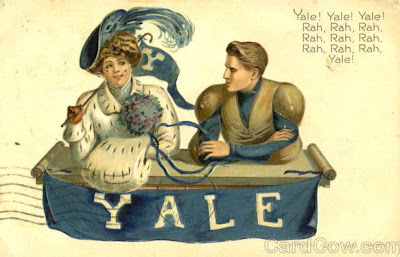 For one thing, Yale had gone co-ed in the fall of 1969 and by the time I matriculated 40% of my classmates were female. 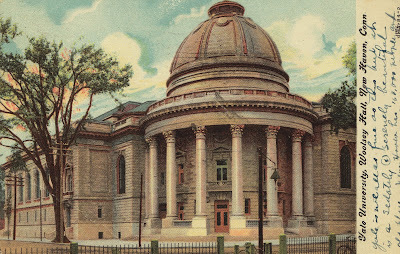 In addition, a substantial percentage of my Yale class were people of differing ethnic and religious backgrounds from my WASP origins, and the majority of undergraduates there had attended public schools. While being a legacy offspring and a prep school graduate was certainly not a liability to getting admitted to Yale when I applied, it was no longer the easy ticket for admission that it had been in my father's day. In other words, Yale had become a meritocracy. 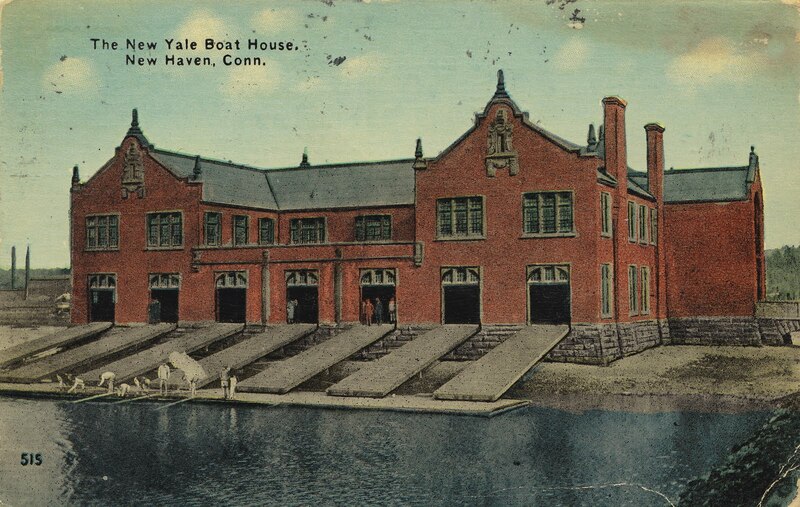 But Yale remained, and remains to this day, a very macho, competitive, and elite university. Today, however, these defining characteristics of the university have nothing to do with the ethnicity or religion or gender of its students, unlike when my father went there when its doors were tightly closed to anyone who didn’t fit a very narrowly-defined vision of who should be admitted. 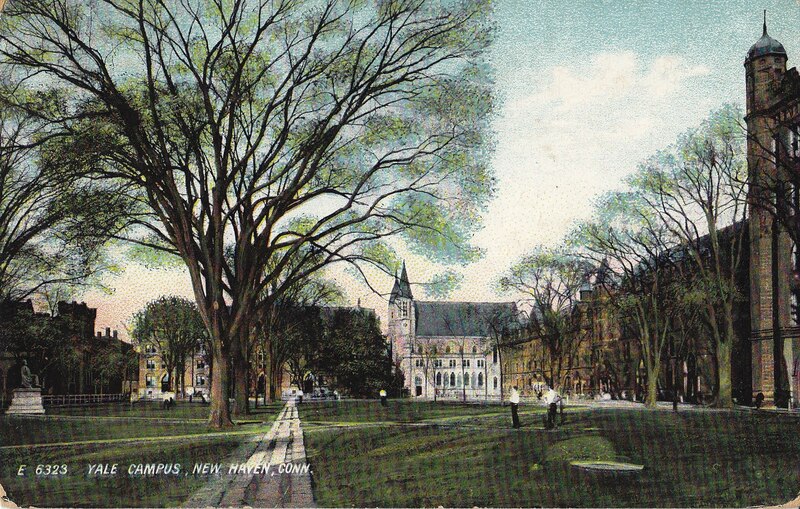 I loved my experience at Yale, and I look back on it fondly and with respect. I feel fortunate to have been able to go there. One of the things that has changed since I was an undergraduate at Yale is that the stigma of being gay in this country has largely dissipated in the intervening years, at least among sophisticated, educated people, and had long since become a non-issue among my classmates by the time of my 25th reunion, held in June 2004. But when I was an undergraduate at Yale in the second half of the 1970s, being gay was still stigmatized to a degree that would be unfathomable today, at least here in America. 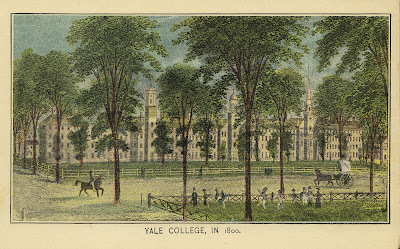 Even though Yale had become known by then as politically liberal (a reputation that enraged many of its conservative alumni), it was not yet acceptable to be gay in the social and athletic circles I ran in at Yale, and many of us callow youths there so inclined weren't brave enough to publicly admit our true orientation as undergraduates. Sure, there were a couple of out militant lesbians and extremist gays on campus, but they were marginalized exceptions, and were most definitely not found among the campus leaders whose ranks I aspired to join one day, and eventually did. While I (discretely) came out to a few of my closest friends during my senior year at Yale, it was not until half a decade or more after graduating from Yale that I finally fully accepted myself as a gay man, and closed the door—once and for all—on thinking that a life with and marriage to a woman was a possibility, however remote, for me. 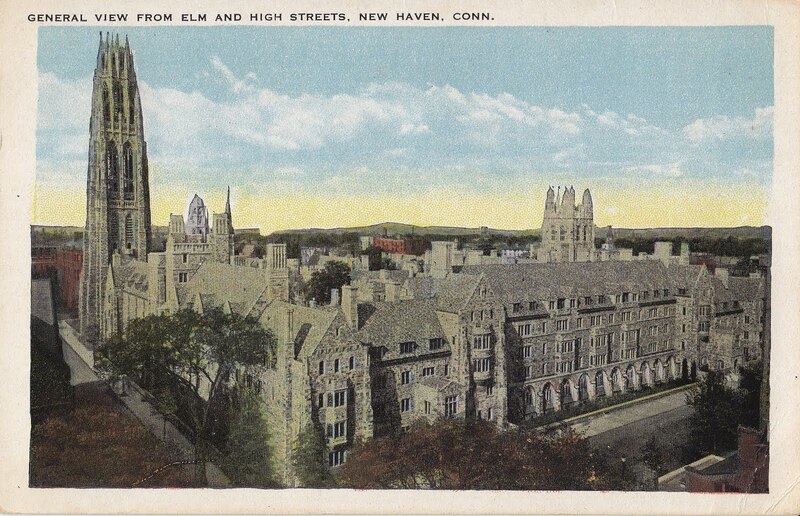 It was not until my 20th reunion at Yale that I brought one of my partners with me back to New Haven, when I brought Boy Fenwick, my partner in life (and more recently my legally recognized spouse, at least in Massachusetts where we got married two years ago) with me. While some of my classmates were slightly taken aback when I first introduced Boy to them at my 20th reunion, they rallied immediately. And when he joined me at my 25th reunion, no one batted an eye. I had a marvelous time at my Yale 25th, and having Boy there with me by my side was an important part of what made the experience memorable for me. Needless to say, that would not have been the case for any of my father’s classmates who would have had the audacity to do such a thing at their 25th reunion in 1969, where they would likely have been met with disapproving astonishment at such an introduction, and where the offending classmate and his partner would have been ostracized, if not asked to leave immediately. Bull dog! Bull dog! Bow, wow, wow! Eli Yale! I'm glad that I graduated from Yale at such a time that I was not subjected to this type of treatment at my 25th reunion. I'm also glad that I came of age in America when it had become possible in the world I come from to publicly admit to being gay without the fear of complete and utter ostracism. 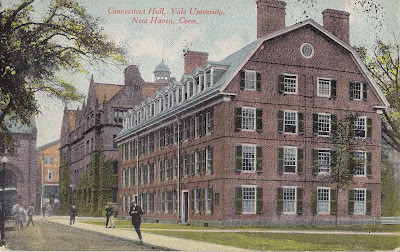 I am not sure that I would have been able to admit to myself that I was gay if I had been in the class of 1944 at Yale, considering the way of the world back then. Given who I am and the background I come from, I believe I would have done the expected thing then and gotten married to a nice girl from a similar background and had a family, as many gay men of that generation did. But I would have always known, at least subconsciously, that I had chosen to do something that did not come naturally to me. I also believe that it wouldn't have been fair to the woman I married, because I would not have been able to truly love her with the passion such a union deserves. 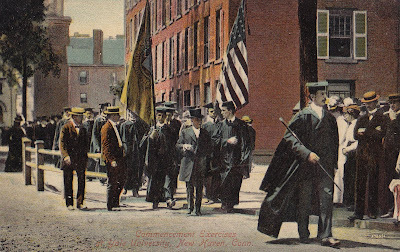 Fortunately, through advances since then I did not feel compelled to pursue that path—unlike I am sure a number of my father's Yale classmates . . .
With their glasses raised on high . . . I must admit, though, being gay hasn't exactly always been a cake walk for me, and it certainly isn't something that I would have chosen had I been given a choice in the matter. But I wasn't, and so I have made the best of it as far as I have been able to. Last year I had the pleasure of meeting Lisa of the blog Privilege for dinner in San Francisco when I was visiting the City By the Bay during a business trip. Over the course of the evening we hatched a plan to write guest posts on each other’s blogs about our 25th college reunions, hers at Princeton and mine at Yale. When it came time to write my essay, though, I decided to slightly alter my subject and write about the three 25th college reunions that I have attended over a forty-one year span, the first two at Yale and the third at Vassar. I did so as I believe they illustrate how one aspect of life has fundamentally changed over that period for a certain group of us here in America. And that change has been for the better—at least in my view. 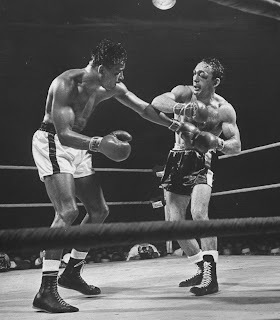 I have since edited and slightly expanded that essay, and will be publishing it as a three-part series here at Reggie Darling. Herewith, Dear Reader, is the first installment. 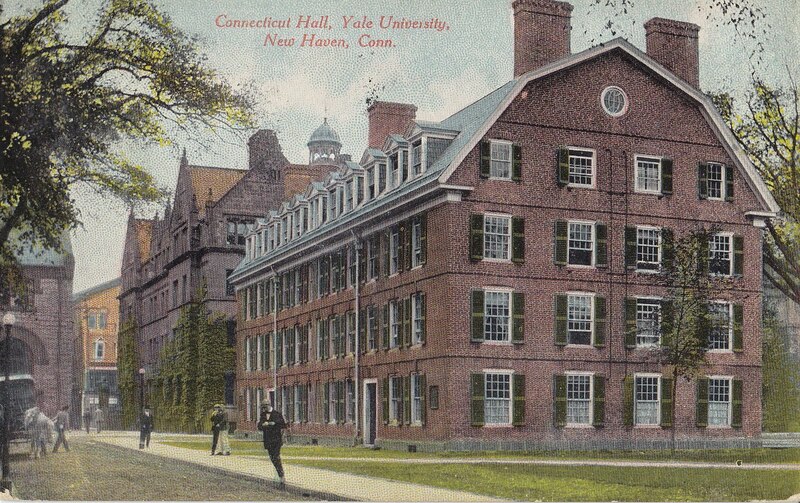 I attended my first Yale 25th reunion in June 1969, when I was twelve years old. 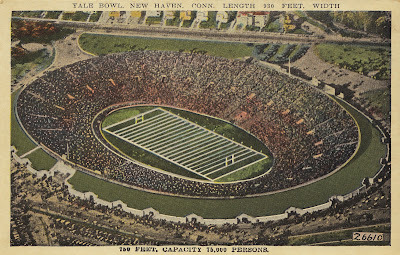 I was there because my father, known as FD, was celebrating his 25th reunion that summer, having graduated from Yale in 1944. 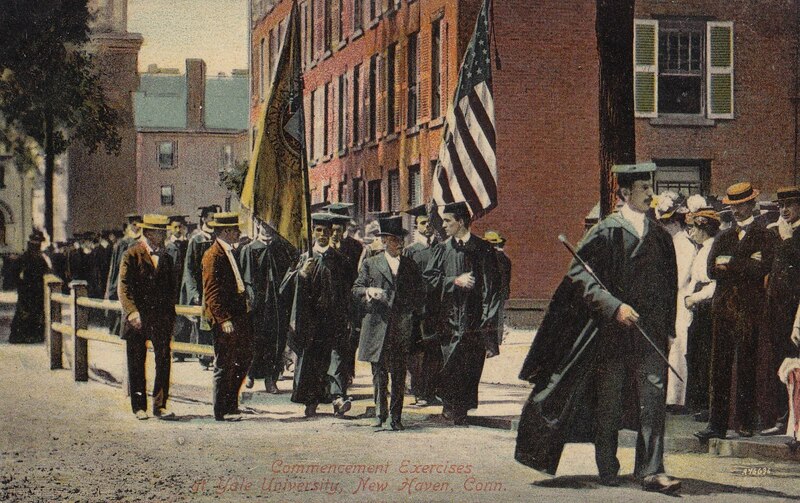 My father’s Yale class was a pivotal one, because it was one of the last that enrolled there before America entered WWII, and was almost entirely populated with the types of men that had attended the university since it was founded in 1701—namely White Anglo Saxon Protestants, the offspring of this nation’s ruling classes, largely drawn from the east coast, and the product of its elite boarding schools. When my father applied to college he did so only to Yale, since it was a foregone conclusion that he would be admitted there. As he told me when I asked him years later, it didn’t even occur to him to apply anywhere else. FD brought our family with him to his 25th reunion, including my mother, my three older siblings, and me. I was pretty much odd-man (boy) out at the reunion, because I was too old to engage in the activities organized for children, not old enough to hang out with the teenagers, and too young to join the adults, whose primary occupation there appeared to be drinking and talking while wearing white tennis hats emblazoned with a blue "Y" and the reunion's blue-and-white striped jackets. My older siblings didn’t want to have anything to do with me, since I was a “dumb twelve year old,” and my parents were otherwise engaged. So I spent a lot of time on my own hanging around the Class of '44's reunion tent observing what was going on. 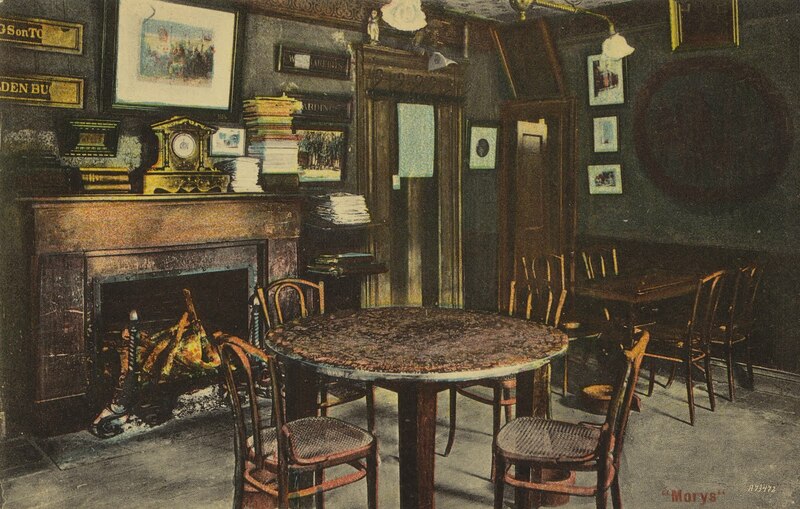 One of the attractions of doing so was it provided me—in stark contrast to home—with unlimited access to Cokes, bottomless bowls of peanuts, and endless cheese and crackers, since the tent was set up with a fully stocked bar continuously manned with a fleet of accommodating bartenders morning, noon, and night. I was in twelve-year-olds' Heaven. 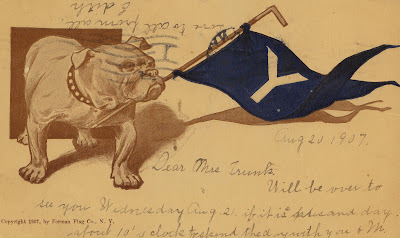 My father's class at Yale was a particularly distinguished and accomplished one, and for a number of years bore the distinction of having made the single largest 25th reunion class gift in the college's history (a distinction that has long since and many times been surpassed). One of the highlights of the reunion was when one of my father's classmates, John Lindsay, who was then Mayor of New York, spectacularly arrived with his wife, Mary, and their children by helicopter and landed in the middle of the Silliman College quadrangle, where the reunion was being held, much to the delight and awe of his classmates and their families. Talk about making an entrance! As I wrote earlier, I spent much of my father's reunion hanging around the class tent observing what was going on around me. I was fascinated by the bartenders working there. I got to know a number of them by name, and I enjoyed speaking with them when they weren't all that busy. 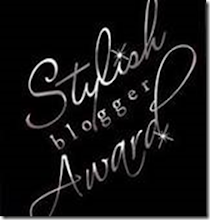 One evening, while lurking around after my parents had staggered off to bed, I noticed that one of the bartenders was having an argument with his manager, and I sidled over to see if I could overhear what they were fighting about. It turned out that the bar was understaffed that evening, and the bartender was complaining that he didn’t have time both to wash out the used glasses and also to man the bar (this was back in the days before plastic glasses were used at such events). Having nothing better to do, I volunteered that I would be happy to wash glasses for them, and—much to my surprise—the exasperated manager agreed to let me do it (something that would never be allowed today). I spent the next several hours happily washing glasses and delivering them to the bartenders, who were quite pleased for me to take this burden off their hands. I had such a good time doing it, in fact, that I spent the better part of the rest of the reunion washing glasses behind the bar, and I became something of a mascot for the bartenders. My parents were more than happy to let me do it, too, since it got me out of their hair, they knew where I was, and—besides—they thought it was a hoot. At the end of the reunion, much to my delight, the manager presented me with a crisp $20 bill for my efforts. Not only did I get to wash the glasses for my bartender chums, but I got paid for it, too! Or are they Barr, Flight & Barr? I wonder . . . 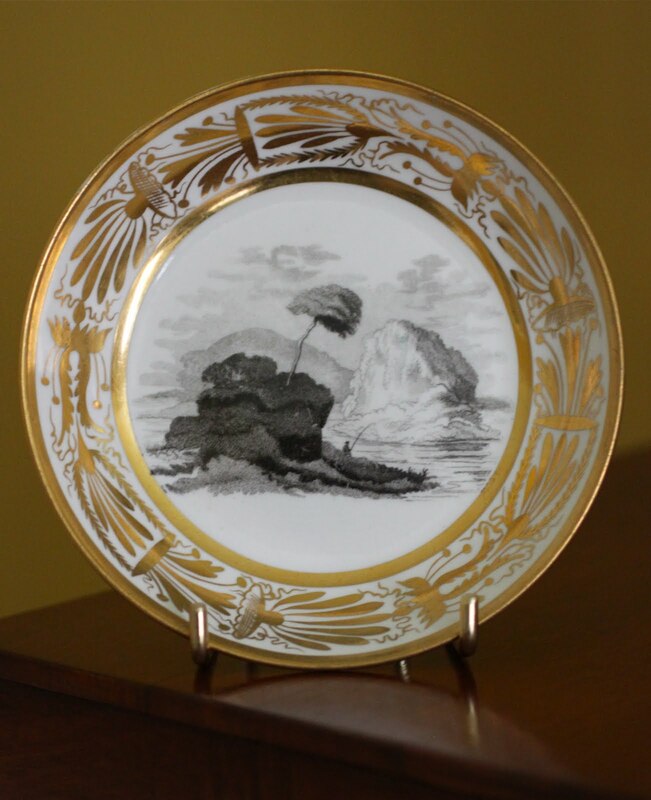 This week I am featuring three handsome saucers from a set of six that we own, decorated with black transfer scenes of various romantic subjects and surrounded by painted gilt decoration in the classical taste. 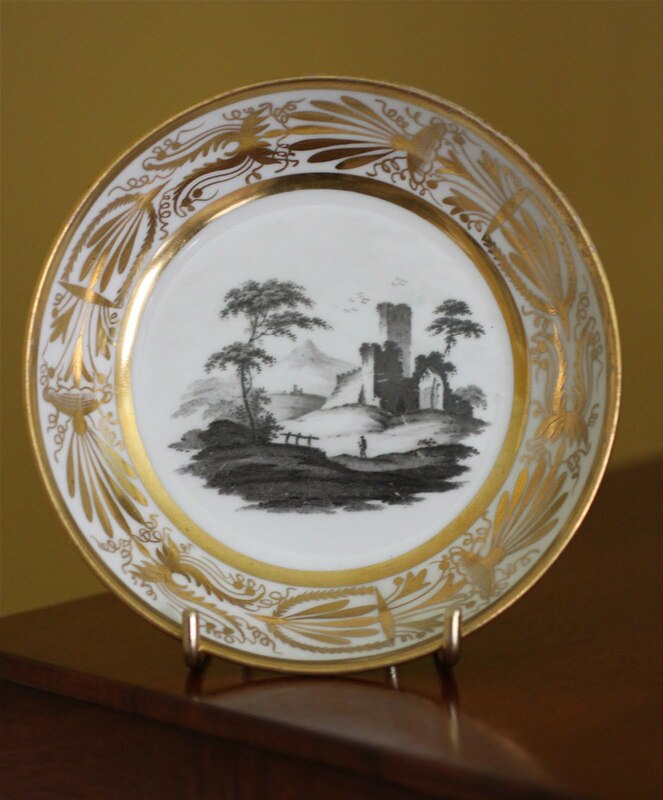 Two of the saucers feature a large Gothick castle in a parkland setting, two feature a rugged lakeland view with a fisherman, and two depict a picturesque ruin in a hilly landscape with a passing figure. I am not exactly sure where we bought the saucers, but I believe it was from a dealer in Hudson, New York, who has since gone out of business. I think we got them thirteen or so years ago. I believe these saucers were possibly made in one of the factories of the Flight & Barr partnerships, active in Worcester, England, from 1792-1840. 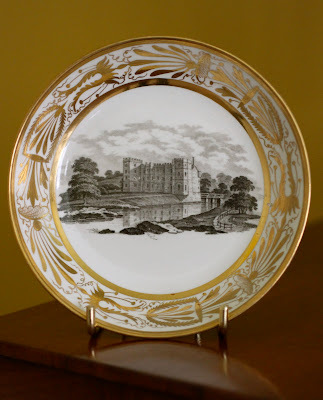 Known as Flight & Barr from 1792 to 1804; Barr, Flight & Barr from 1804 to 1813; and Flight, Barr & Barr from 1813 until 1840, the factories produced some of the handsomest porcelains made in England during the period, meriting their Royal Warrants as porcelain-makers to the (then) King Georges. The saucers, which measure 5 3/8 inches across, look exceedingly well when displayed on either side of one of our French gilt-bronze clocks on one of the mantels at Darlington House. I am rather partial to their gold, white, and black decoration, and they are a great favorite of mine. While I believe the saucers may well be a product of the Flight & Barr partnerships in Worcester, I am not able to confirm that definitively, as they are unmarked. If any of my readers have more information as to their origin, I would most gratefully appreciate it. Well, not exactly a Road Trip, more of a stolen afternoon, really. A month or so ago I found myself, much to my surprise, in Houston, Texas, where I was a last minute addition to a client meeting one morning. The meeting took place, coincidentally, at the same time as one of the city's largest annual conventions, and every hotel, rental car, and flight in and out of the city was either booked or jammed. Although my meeting was over before noon, the first flight I could get back to New York that day was at six thirty in the evening. So I had the afternoon to kill in Houston. And I was thrilled that I did. 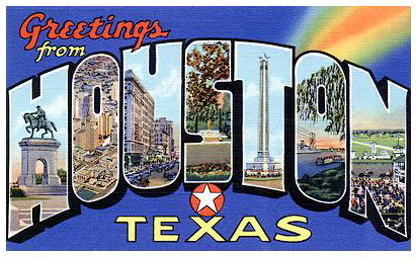 I have been meaning to visit Houston for some time now, as a tourist. Houston, you may ask? What does Houston have to offer a person such as Reggie? Rather a lot, as it turns out. And I just scratched the surface of it. I would very much like to go back there again and spend several more days checking out the city's sights and pleasures. My favorite hotel to stay in when I visit Houston is the Four Seasons, but it was fully booked during my visit, and the only hotel option available to me when my assistant booked my travel plans was the Marriott at the airport, so that's where I stayed. Although Reggie doesn't usually care to find himself in such places as a Marriott, particularly when traveling on business, he was perfectly fine with it on this trip, and he didn't kick up a fuss that he wasn't staying in the best hotel in town (unlike some of his colleagues he was traveling with). The room I stayed in at the Houston Airport Marriott was perfectly clean and quiet, the bed was more than comfortable, and the water pressure in the shower was excellent. So who needs Frette sheets? The next morning, after my meeting was finished, I happily waved goodbye to my BlackBerry-mad colleagues as they stampeded back to the airport to spend the afternoon waiting and working in the Presidents Club lounge, hoping to catch an earlier flight to New York. Recognizing that I had the rare opportunity (and excuse) to spend a free afternoon in Houston, I had asked my assistant to book me a car and driver to ferry me about during the afternoon I was there, in order to maximize my efficiency in seeing as much as possible of the city in the few short hours I had available to me. I was more than pleased when up drove a brand new Lincoln Town Car to meet me, with an excellent and good-humored driver behind the wheel improbably—and delightfully—named Satchmo. And yes, he was named after the great (if not the greatest) jazz horn player. Satchmo and I got on very well, and enjoyed each other's company during our time together. 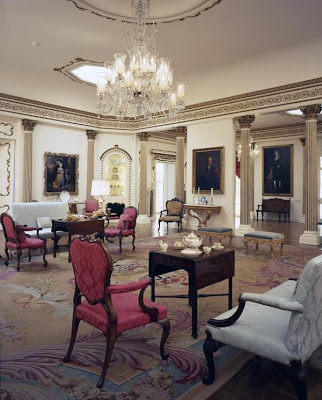 With but little time to plan for my visit to Houston and only a short time there to see its sights, I decided to take a surgical strike approach when planning my afternoon's itinerary, and I confined my activities to only a few places within a relatively close proximity. 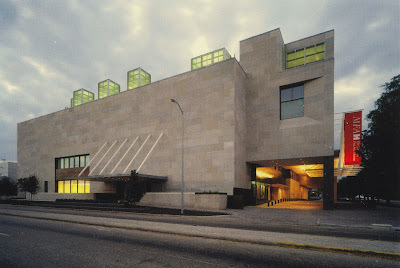 As readers of this blog well know, Reggie's first port of call in most of the cities he visits is the primary fine arts museum. 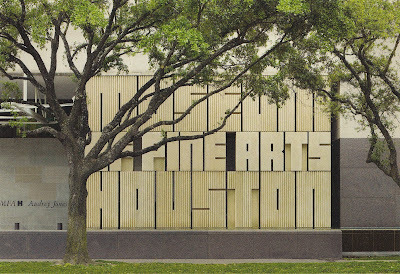 And that's where I headed—to the Museum of Fine Arts, Houston, also known as the MFAH. The museum has recently undergone a mammoth, and mostly successful, expansion, and is now comprised of a campus of buildings covering several acres, built in styles ranging from the neoclassical to the modern. 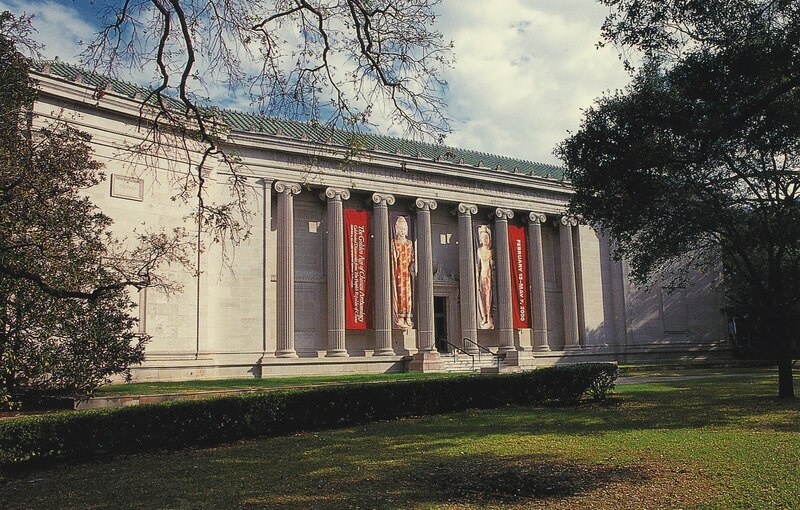 Walking around the MFAH one appreciates the city's extraordinary wealth and philanthropy, which has not only funded such a lovely museum, but endowed it with a superb collection of art. I usually prefer to spend the bulk of my time when visiting a museum touring its permanent collections, instead of the traveling blockbuster exhibitions from other museums often on display. In this case I enjoyed touring the MFAH's excellent collections, but I was also more than happy to spend time touring a splendid show there co-organized by the MFAH and the Musée du Louvre. 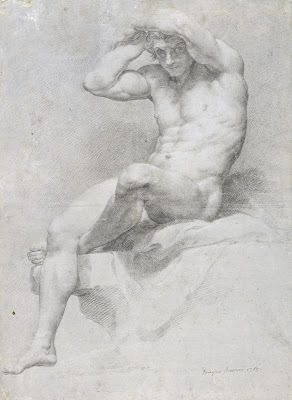 Titled Antiquity Revived: Neoclassical Art in the Eighteenth Century, it was a thrilling (for Reggie, at least) jaw-dropper of gorgeous objects, statues, paintings, drawings, and furniture all in the neoclassical taste and styles of the latter eighteenth century. In other words, right up Reggie's alley. And on top of that, it was full of depictions of the most beautiful nudes imaginable! I had a lovely time. Afterwards I ate lunch at the museum's very pleasant Cafe Express restaurant of a very satisfying, generously scaled turkey club sandwich and an icy-cold bottle of Heineken, where I sat at a table on a sunny outdoor terrace beside a fountain in which birds fetchingly and amusingly bathed. 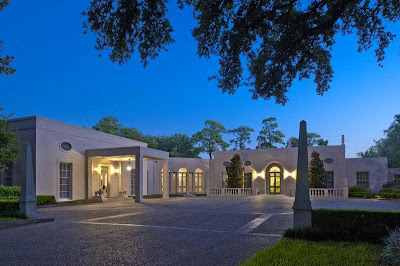 Satchmo was waiting for me in front of the museum and drove me into Houston's River Oaks neighborhood—which to this New Yorker's eyes looks to be as rich and manicured as Beverly Hills—and dropped me off at Rienzi, a house museum owned and operated by the MFAH. Given to the museum a dozen or so years ago by the family of Mr. and Mrs. Harris Masterson, III, who built and lived in it for many years, Rienzi contains an impressive collection of European paintings and decorative arts assembled by the Mastersons (and added to by the Museum). Today it operates as the MFAH's center for European decorative arts. 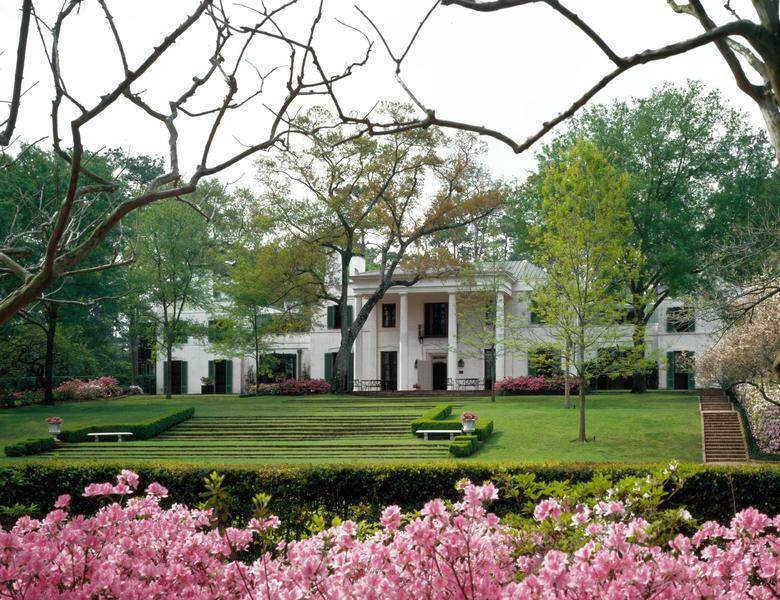 Rienzi is, I must admit, a bit of a mess. Large and eclectically decorated in the very personal, and at times, dubious taste of the Mastersons, it is a hodge-podge of decorative styles and objects. Although I enjoyed visiting Rienzi (and was pleased to be the only visitor there when I toured it), I think the MFAH would be better served if it sold the house and moved the collection to the main campus of the museum (and deaccessioned some of the less noteworthy objects in the process) where it could be better displayed. Don't get me wrong, Reggie loves a good house museum, but the dual purpose of Rienzi as both a house museum and the MFAH's center for European arts isn't very successful. I was—nonetheless—more than happy to visit it. My next and final stop was the one museum in Houston that I have wanted to visit for over thirty five years, and which the opportunity of seeing was the primary reason for why I chose to spend the afternoon in Houston, rather than scurrying back to New York at the first opportunity. 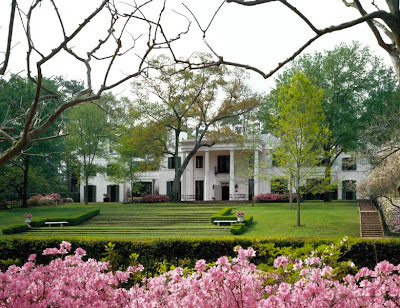 For those of us who are students of the American decorative arts, as Reggie is, Bayou Bend is one of the most iconic collections of eighteenth and nineteenth century American decorative arts in this country. Assembled by the unfortunately named Ima Hogg (what a cross that must have been to bear) in the middle twentieth century, it is displayed in a large Regency style mansion (in Houston they appropriately call their big houses mansions) built and lived in by the immensely rich, antique-collecting-mad, Miss Hogg. 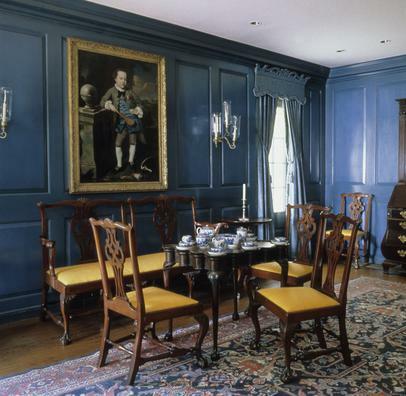 Donated to the MFAH in 1965, the house has been reconfigured as a museum of period style rooms containing American furniture and decorative arts dating from the earliest Pilgrim settlers up though the latter nineteenth century. 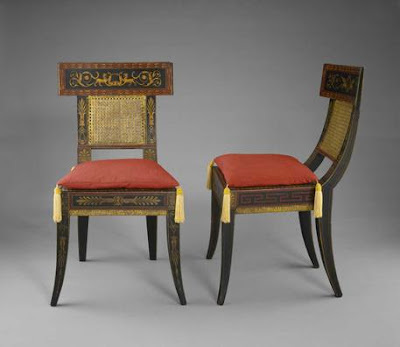 The collection is most noteworthy for its late eighteenth and early nineteenth century furniture and objects, and it also has a substantial collection of decorative arts with a Texas connection. I was escorted through Bayou Bend by a charming and highly knowledgable Houston lady docent, whose passion for the museum and its founder was admirable, and infectious. In Reggie's view, these Texas gals can teach their northern cousins a thing or two. Not only was my docent smart as a whip and had an amusing, sharp sense of humor, but she was dressed to the nines, fully made up, and was wearing an impressive array of jewelry (this was Texas after all) and her hair was done up in a marvelous, upswept blonde bouffant hairdo. I loved her! 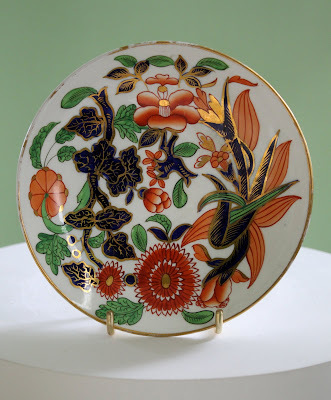 At one point during the tour, my docent showed me into a Federal period style dining room and asked me to look at a large display of Chinese Export porcelain on the table. As I was doing so, she explained that the service had only recently been given to the museum by the Bayou Bend Ladies Auxilliary Committee, on which she sat, in honor of the fifty-fifth anniversary of the museum's opening to the public. Imagine my astonishment when I realized that the service on display was of the very same Thomas Willing service of Chinese Export porcelain that I had bought three plates of at the New York Ceramics Fair back in January, and which I posted about here on Reggie Darling! Needless to say the docent was as surprised as I was at this news, since not only did I know exactly what I was looking at, but I also owned examples from the same service. We practically fell into each others arms with joy! After that excitement the rest of my visit to Bayou Bend was a bit of a blur, and we had to race through the remainder of the collection so I could meet Satchmo out front in time to make my flight back to New York. With that I bid my docent and Bayou Bend a fond farewell, and hurried on my way. Antique Wine Coasters, Why So Wide?